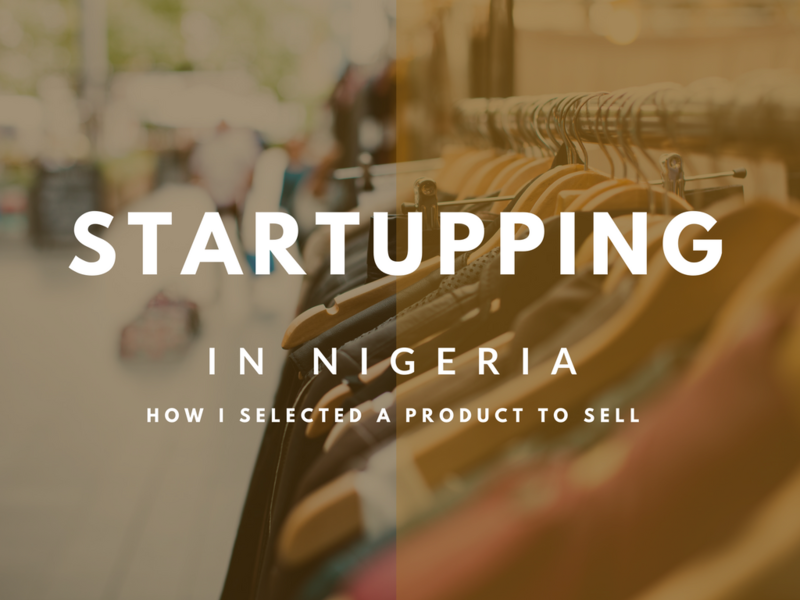 In my previous post, I discussed the reasoning behind my crazy decision to start a global business from my base in Nigeria. Following on from this decision, I decided to sell a physical product to the world, using an e-commerce fulfilment house How this works is that I purchase a product in bulk from a supplier, brand it with my details, and market it. Whenever I “sell market”, the fulfilment house picks the order and ships it to my customer anywhere in the world. This way, I can focus on marketing and customer service from my base in Nigeria or anywhere else I choose. I’d like to go share my brainstorming process in deciding on what to sell to the international market. Basically, what I’m trying to develop is a product which fits around my lifestyle (rather than the other way round). I came up with a list of criteria to help me ensure that my product was a good fit for the market, as well as a good fit for my business objectives. Straightforward enough. The first step in this whole process was to come up with a product which would appeal to the global market, and which I could brand uniquely. So for this post, I’d like to go share my brainstorming process in deciding on what product to settle with. Basically, what I’m trying to develop is a product which fits around my lifestyle (rather than the other way round). The business model I would like to implement is one which is location-independent, which means that it is something I would like to be able to manage from anywhere in the world I decide to be based. I have small children, so I wanted to come up with something to allow me to spend time with them. In a nutshell, here us the list of criteria I used to help me ensure that my product was a good fit for the market, as well as a good fit for my business objectives. Product I can sell without being physically present, to give me the freedom to operate the business from anywhere. As the item is to be sold online and delivered by post, it needs to be relatively light to keep shipping cost down. The dimensions should be small enough to fit through a letter box. This isn’t a hard and fast requirement, but it would be nice. The product has to be cheap to acquire. If possible, it has to be a raw material I can add value to. I didn’t want to sell electronics. Having sold electronics in my past life on eBay, I have experienced firsthand the headaches involved in dealing with DOA products, warranties, exchanges etc. Let’s just say never again. When brainstorming for a product which for all the criteria above, the bulk of my research was done through the Amazon website. Most people regard Amazon as a great place to “buy anything”, but Amazon’s potential as a global marketplace makes it such a great research tool as well. While Nigeria-based sellers cannot yet offer their products for sale on Amazon, there is real value in the site’s potential for product-focused research. Besides, if you have seen Amazon’s business seller requirements nd charges, you would realise that not being able to sell on Amazon isn’t really a problem. Personally, I would rather have control over my store than hand the keys over to Amazon. I started by trying to find the top performing products in order to increase my chances of success. Better to gamble on an item with with customers queuing up outside the door, than to pick a random product and hope for the best. So I can’t exactly give you my blueprint, (I’m sure you would agree that it would be foolish to show you how to compete with me) but I’ll share the rough idea. I went to the category page featuring the niche I was interested in, and I clicked on the “Bestsellers” link. Key thing to remember in looking for best sellers is that we do not want to create demand – we want to leverage existing demand. This should bring up the best selling products for the last day, and Amazon updates this page every 12 – 24 hours. Identifying a best-selling product meant that I had also identified a potential competitor, so I decided to take a closer look. I clicked on the customer reviews, and filtered this to the negative feedback. My objective in doing this was to figure out if customers had any complaints about the items, which I could improve on. Here is what I mean, using the No. 1 selling Banana infant training toothbrush as an example. This page teaches us a lot about how to successfully set up a No 1. Bestselling product page. Include lots of photos of the product, as shown on the left. Write a descriptive product title. They could have stopped at “Banana toothbrush”, or even “Banana infant toothbrush” but No. They had to offer as much information about the product as possible in the title. That said, it’s time for my favourite part – looking for witnesses, sorry – weaknesses! When I applied this to my product, I noticed that most people complained about the presence of an artificial substance in my competitors products, so I knew that I had to find suppliers who offered a product without any artificial products. I also needed to communicate on the packaging that our product was better than the competitors because it was free of artificial products. To further narrow down my search to a particular product, I had recently started embracing a natural, chemical-free lifestyle, so naturally, the natural community was a great starting point. As I didn’t want to sell a product I couldn’t use myself, I finally decided on a natural skincare product which addressed a common skin problem in children and adults. A keyword search using Keywordtool.io threw up 600 search results for the condition, with buyable keywords in the first 5 results. I didn’t want to waste time on a long, fruitless keyword analysis strategy – I just wanted to know “Are people searching for this keyword with the intention to buy?”. A quick analysis of of the most search keywords associated with the phrase I was searching for showed searches like “cure”,”cream” and “treatment”, which I took as buying signals. I had picked a product to sell. Next, to find some suppliers. the product itself. Thankfully, this was the easiest part to find. I wanted a 100% organic product and a Google search for the product very quickly found me around 7-10 suppliers for the product. While I initially wanted a dropshipped product, I was very quickly able to determine that it would not be possible to find this, and I had to adjust my expectations. I could have adjusted the product, and persisted in finding a product which could be dropshipped, but I admit that I was emotionally vested in this particular item by this point. I do realise that this goes against my better judgement, but I had a long (admittedly convoluted) way around it. I planned on getting the product from the supplier I found, and then asking a friend to help with the packaging and dispatch, until I can pass this part on to a fulfillment house. If you’re sourcing products from China, Alibaba.com is a great place to start searching for suppliers. All you need to do is type in the name of the product you are looking for in the search box, and you should get a list of suppliers for your product. Once you have your list, it is a good idea to check whether the listed supplier is a manufacturer or trading company. You can tell this by visiting the company profile and looking in the “Business Type” area. Tip: It is usually best to deal directly with a manufacturer, as a trading company is a middleman whom you would likely be paying just for the connection. Still on Alibaba, you will need to check how long the business has been active. Each listing will have a badge with the number of years active. The longer a company has been active, the more trustworthy it sounds. You might also want to search for the company on Google, just to see what rocks up. Sometimes, you’ll find websites talking about the business or even warning you about the business. In most cases, not much will turn up on Google other than their physical location in Google Maps and their official website. Still, it’s a good idea to check, just in case. Finally, while this isn’t mandatory, a supplier that Trade Assurance is a more secure bet to place your money. Trade Assurance means that your payment is protected under Alibaba in case anything goes wrong, and most businesses offer this. the product packaging. For this, I went on eBay to find unmarked attractive outer packages which were also waterproof. The individual items needed some additional individual packaging, and I couldn’t find this on eBay, but a quick visit to Aliexpress solved this problem. the product branding. I needed a nice design to go on my product, and I wanted to choose a designer based on his or her previous work. As such, I needed a platform where I could gain inspiration from the previous work of existing designers. Behance was great for this, as I just had to type in packaging design and I got a great list of inspiration to look at. I found one I liked, and contacted the designer and he was happy to work on packaging my product for $100. fulfillment houses. While I didn’t need this now, I wanted to find one I could potentially work with. If you’re not familiar with the term, a fulfillment house is an organisation whom you send your raw stock to. They then pick, package and ship your orders directly to your customers when you get a sale. They are great if you are not domiciled in the country where your marketing efforts are concentrated. I had some help with packaging and postage to start with, but the fulfilment house was where I would send all my products, packaging and labels to eventually.